I look here at this cat, this light of my life, this part of my heart, and I wonder how I got here - oh, I know she showed up on Independence Day over 17 years ago, riding so quietly next to Michael in the little blue truck he owned then, and I wasn't happy about it, I really wasn't, but there he was with this kitten in his hands, trying to ease my broken heart of 2 months, this kitten born the day my older cat had died, and what was I to do but go to the awful little grocery store near my house in the country, the grocery store whose roof leaked and if it was raining you had to skirt your way around buckets placed in the aisles, and I didn't even go near the butcher section, it was too disconcerting, and they had no kitten food, but off brand cat food - enough for a day or so, and she was mine. That's how simple it was. I thought she had no personality, this kitten who looked so much like my old cat, Stella, those looks being the reason Michael chose her, scooped her out of her safe life at his sister's house, away from her siblings and mom and the dog who used to lick her ear, those looks the reason she found herself in a strange place with a strange woman. At last she had a name - Maggie, Miss Magnolia - and it took a while for us to fall in love with each other - she is not one to easily give her heart away, and I hardened mine, I admit it and I feel such guilt, but I'd not wanted another kitten, not yet, not that soon, my heart still hurt from Stella's sudden death, and I knew this one would break my heart also, and I was angry with Michael for bringing me sure heartache, but she was there, she was home, and though it took a couple of months, maybe 3, I admit that also and am not proud of myself, the day came when I finally realized how much I loved her, when my heart felt not closed anymore, when I could feel it in my chest, beating away, when I could feel the meltiness of it when I picked her up and held her close, and only later did I realize she waited to love me also, this cat who loves so few. These days my guilt comes when I grow exhausted with the daily care she needs - I admit this also, and again, I am not proud of this feeling - the constant watching and worrying, the fear that today is the last even when she seems fine. She is often sick in the morning, and I begin my day tending to that, first thing out of the bed, sleepy, angry, scared, wanting her to just be well, feeling guilty for all of those thoughts as I clean, she meowing for I know not what, more food, to be outside, to be in my lap, and the meowing seems more than I can take, and too loud, my fear the background chorus, all churning in my head, I just wanting silence and for this to stop, but crying through it all because I really don't want it to stop, only the morning sickness, she is fine the rest of the day, still able to jump in and out of an open bathroom window, stalk birds and lizards, but this morning she is outside longer than usual - having eaten and headed for the sunshine, and that has aroused a new fear - why is she not in here, wanting to be in my lap, wanting to walk across this keyboard, what does this mean, and the guilt is huge, though I was extra kind to her this morning, I worry that she overheard my crying on Michael's shoulder yesterday, that she will no longer want to be in my lap, which has been a true gift 17 years in the making. She is sleeping standing up beside one of dogwood trees - I can't remember if it's the pink one or the white, but I can see her if I get off the couch and check in the mirror next to the door; if she were awake she would see me - she always does, her glance goes immediately to that mirror and usually she heads for the door. Relyn posted about time today, about it flying out the door, and it made me cry, this awful time that won't stand still, and I watch this cat grow older and though she is as healthy as can be she still has this awful kidney disease, and I am angry at that, I want things to just be the way they were, like a child, can't we have do-overs? But we can't, we don't, and what would I change anyway except those first few weeks she lived with me? For now, I keep her alive, Michael and I together, and the vet, and as long as she is happy, that is more than enough. I believe I will go wake her, entice her inside - it is too late to wash my hair, so perhaps she will keep me company over some toast. I live with a 17 year old cat and I completely empathise. Completely. May we both have a few more years with them although, of course, infinite time would be preferable and maybe even possible. The bond you two share breaks my heart...and opens it too. It's this love, complete with all the tears and worry and guilt that fills your life with richness and beauty, even if it doesn't seem so sometimes. Our furry companions teach us so much about how to love, and also, when we must...how to let go. But today, she is sleeping standing up, right outside...not too far from you. She's still here, keeping an eye on you and your tender heart. i love how you write and express yourself . your love is so deep and real. if time could stand still would we really want that? my cat is young, active and sometimes feisty to the point of irritating me and i'm wanting her to grow up, be calm and cuddle with me. i need to appreciate the now. I can empathize. Sometimes when my almost 14-year-old feline son, Julius, wants to sit in my lap when I am reading, stitching, whatever, I am annoyed with him for a minute, but then I think about how I will feel when there is no lap cat in the house. Hello! My first time visiting (I came over from Ink on My Fingers!). 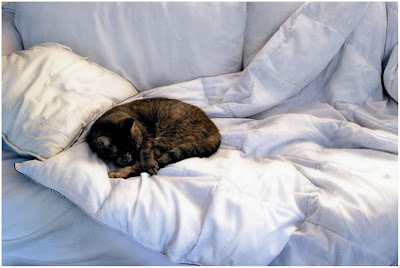 First let me say I love your blog and the photo of the cat for this post is so touching! I am a dog owner of a 10 year old dog and I remember about 3 weeks after we got her sitting on my kitchen floor having what I can only call dog owner post-partum depression. I cried because I could not seem to make her happy - she ALWAYS wanted to go out, be fed etc. Now a days as I sit and watch TV in the evenings and look at her I wonder if I have done enough for her. Never ever did I imagine that dog could reach in and touch my soul, my being, with such depth. It is a hard road... after all the love they give us... it is a hard road on both sides, yes? But how wonderful that she has been around so much longer than anyone would've thought! This gift never ends, this Maggie.